I was very fortunate to be invited as a speaker at Kim Arnold’s UK Tarot Conference in London a couple of years back. I spoke about how to interpret Court Cards – which won’t surprise you, I’m sure! Kim invited all those Tarot speakers from her previous Conferences, such as Rachel Pollack, Mary K Greer, Caitlin Matthews, Ciro Marchetti, Carrie Paris, Alfred Douglas … and *cough* me to write an essay on a Tarot Major Arcana card and then compiled them into a book which has now been published by Hay House. What I’m doing in amongst them, no-one knows…. 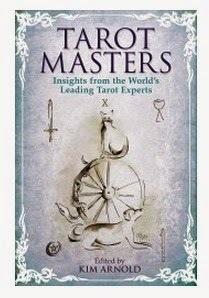 It’s not a ‘reference’ book, but gives you some nice insights into lots of Tarot authors, how they got started on their journey and their opinions on their chosen Tarot Major. In the interests of transparency, please note that if you purchase using this link, I receive a small shekel from Amazon.